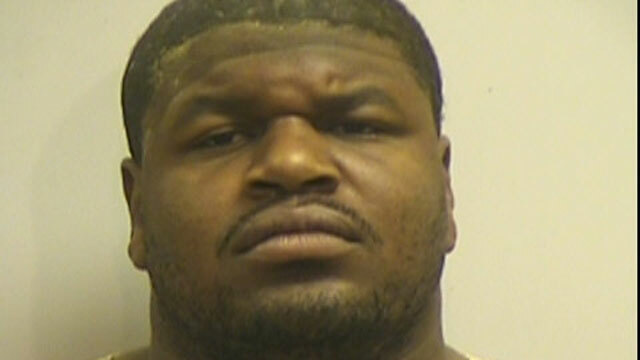 Dallas Cowboys nose tackle Joshua Price-Brent was arrested on an intoxication manslaughter charge today after a single vehicle roll-over killed his passenger, Jerry Brown Jr., who had been a linebacker on the team's practice squad and his former teammate at the University of Illinois. Price-Brent, 24, was allegedly speeding "well above" the posted 45 mph speed limit at about 2:21 a.m. when he hit a curb, causing his vehicle to flip at least one time before landing in the middle of a service road, Irving Police Department spokesman John Argumaniz said. Authorities were alerted to the accident by several 911 callers, Argumaniz said. When police arrived, they found Price-Brent pulling Brown from his 2007 Mercedes, which had caught fire. Brown, 25, was unresponsive and was transported to a local hospital, where he was pronounced dead, Argumaniz said. It was not known where the men were coming from or where they were going, but Argumaniz said officers suspected alcohol may have been a factor in the crash and asked Price-Brent to perform field sobriety tests. "Based on the results of the tests, along with the officer's observations and conversations with Price-Brent, he was arrested for driving while intoxicated," Argumaniz said. This is the second week in a row an NFL player has been accused of being involved in another person's death. Jovan Belcher of the Kansas City Chiefs killed his girlfriend early Dec. 1, then committed suicide while talking to team officials in the parking lot at Arrowhead Stadium. Price-Brent was taken to a hospital for a mandatory blood draw where he was treated for minor scrapes, Argumaniz said. He was then booked on an intoxication manslaughter charge after it was learned Brown had died of injuries suffered in the crash. It is expected that results from the blood draw could take several weeks, the police spokesman said. Price-Brent is scheduled to be arraigned Sunday at 10 a.m., when bond will be set, police said. The second-degree felony intoxication manslaughter charge carries a sentence of two to 20 years in prison and a $10,000 fine. Price-Brent's attorney, George Milner, told KDFW-TV his client is "extremely upset." "There are no words to explain how upset he is," he said. "The focus, from our standpoint, on behalf of Josh, is Jerry Brown, his family, his loved ones, his friends. This is a tremendous loss to him, this was like losing a little brother." He suggested that ongoing construction in the area of the crash may have played a role. "Anyone that's form here knows how much construction is going on out in that area of 114 -- that's hazardous, it's not well-lit at night, it's very difficult to see sometimes," he said. "I've done it sometimes going through there, you don't see these things, and it's changing , it's not as if you know it on Thursday night, and it's the same thing on Friday night, because it seems to change on an almost daily basis. That may have contributed to this." Price-Brent, a 6-foot-2, 320-pound nose tackle, left the University of Illinois as a junior for a career in the NFL. He was picked up by the Cowboys during the 2010 NFL supplemental draft and has played three seasons with the team. The Cowboys are set to take on the Cincinnati Bengals in Ohio on Sunday. "We are deeply saddened by the news of this accident and the passing of Jerry Brown," said Cowboys owner Jerry Jones in a statement. "At this time, our hearts and prayers and the deepest sympathies are with the members of Jerry's family and all of those who knew him and loved him."